ICV and Wiluna Remote Community School (WRCS) have a long-term relationship dating back to 2010, partnering on a number of activities over the years. The school fosters a close relationship with its family and community members who enjoy engaging with the children to help them learn. “It’s very important we have not only community days where families come in but community activities where they can be a part of the learning, where they can be part of the engaging process to get students excited about learning,” WRCS Principal Adriano Truscott said. WRCS identified a mosaic project as an activity to bring the community together and teach the students about the local Martu language and culture. And when it invited ICV to assist we were thrilled to team-up again. ICV volunteer Jane returned to Wiluna and reacquainted herself with some old friends from her time volunteering at the school four years prior. She consulted with local Elders on how the project should proceed and on the design of the mosaics. “A lot of the Elders were here for community day and we gained their input and collaboration on the project as to the imagery that went into the mosaics,” Jane said. It was decided the mosaic tiles would reflect the different periods of the local Martu calendar, which the school uses as the basis of their curriculum. The calendar tells us what is happening during the year with animals, plants, weather and people. For example, it describes the story of how a parnka (goanna) lives, when it hibernates, lays eggs and comes out to eat. Jane initially taught the mosaic process but it wasn’t long before students and community members were independently creating mosaic tiles and designs from start to finish. “This project is a symbol of what learning is like in Wiluna. It’s very exciting because never before have we had so much community input into this project. Every step of the process has had community involvement,” Mr Truscott said. 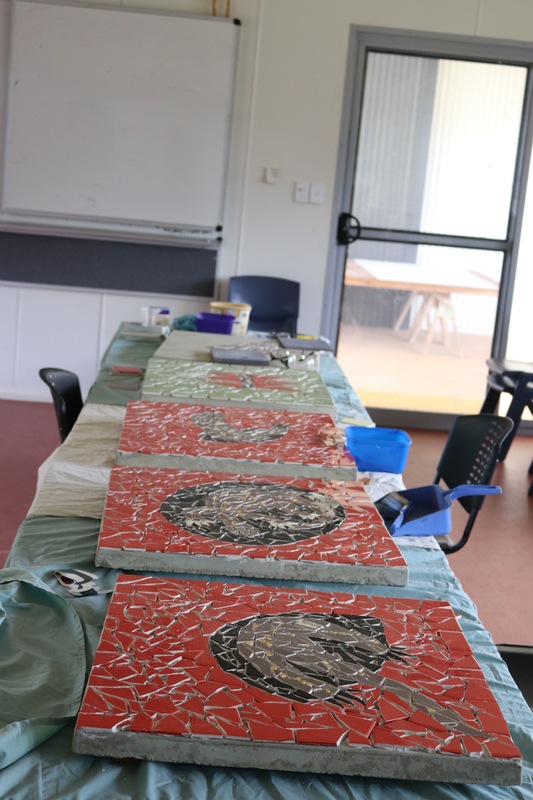 The finished mosaics will decorate accessible areas around the community and be used as an educational resource. Stay informed. Subscribe to receive our e-mail updates. Indigenous Community Volunteers (ABN: 90 093 123 418) is endorsed as a Deductible Gift Recipient. Donations of $2 or more may be tax deductible.